Capcom Vancouver sent out a press release with some interesting Dead Rising 4 facts. To begin with, players have killed over seven billion zombies since the game’s release on Windows 10 and Xbox One, more than Earth’s actual population. But the developers also announced that a 60-minute timed free trial is coming on January 31st, allowing players to earn achievements and carry over saved progress into the full game should they choose to buy Dead Rising 4 after the trial’s end. Both single player Story Mode and Multiplayer are available in the free trial. An upcoming update due on January 30th, on the other hand, will add two all-new difficulty modes as well as five new outfits from Capcom’s sister series, Street Fighter. For players that have tamed the horde and are looking for a bigger challenge, we are introducing two new difficulty settings for Story Mode for Xbox One and Windows 10 PC players. The two new levels scale in difficulty from hard to ultra-hard. Playing either of the new modes will earn players new gamerscore and achievements (“Chopping Spree” and “Biters Remorse”). Frank will need to be a lot more careful and aware of his surroundings when trying to survive on a higher difficulty. Enemies do more damage; Frank’s weapons break faster and food restores less health than before. Keep your eyes peeled, watch your back, and don’t forget to scrounge for every weapon – you are going to need them. Also, Frank West has always had a love for flair, and as the world’s best zombie slayer we’re equipping him with a new outfit collection befitting his stature. 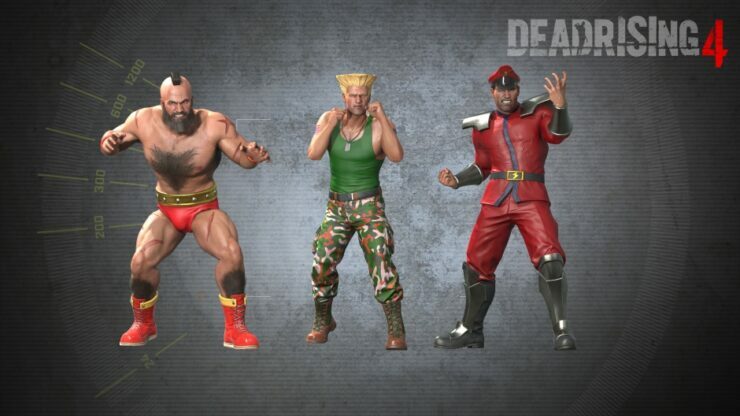 On January 30th Xbox One and Windows 10 PC players will be able to download five outfits from the ultimate fighting game series, Street Fighter, including Cammy, Guile, M. Bison, T. Hawk and Zangief. While in game, just visit your wardrobe and you will find these five outfits for your ultimate zombie fighting experience. Finally, Dead Rising 4 will be purchasable in Germany from the Microsoft Store on January 31st, marking the first time a Dead Rising game becomes available on the German market (previous entries were banned due to Germany’s strict regulations). Dead Rising 4 ditches a lot of the series traditional trappings for a more polished and focused adventure that provides a chaotic, yet enjoyable zombie-slaying adventure. It’s a Christmas story filled with intrigue, charm and most importantly, chainsaws. The game is expected to launch soon on Steam and next Holiday on PlayStation 4, according to Capcom’s earlier statements.